STEPAN KUBIV, GOVERNOR OF THE NATIONAL BANK OF UKRAINE — CHRISTINE LAGARDE’S ACHILLES HEEL IN UKRAINE, OR IS THAT BARACK OBAMA’S FLAT FOOT? 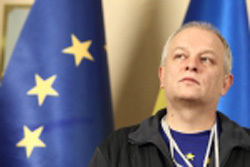 The International Monetary Fund’s senior officials have known that Stepan Kubiv, Governor of the National Bank of Ukraine, was removed six years ago for his involvement in a massive bank loss and loan diversion, when Kubiv was in charge of Kredobank, a west Ukrainian bank owned by PKO Bank Polski, the leading bank of Poland. The affair cost Bank Polski at least $350 million in 2008 and 2009. Another $144 million was provided by Bank Polski to save Kredobank from insolvency. At the time, Kubiv’s management performance led to his replacement by the chief executive of Bank Polski, Jerzy Pruski. The bank scandal was discussed officially, Bank Polski has reported, with the National Bank of Ukraine (NBU) and with the Central Bank of Poland. The Kubiv dossier resurfaced in Warsaw after February 24, when Kubiv was named by the new Ukrainian Government to head the National Bank of Ukraine (NBU). In that role, Kubiv has been identified by the head of the IMF Ukraine Mission, Nikolay Gueorguiev, as the key Ukrainian official, under President Petro Poroshenko, who will decide what audits will be conducted of Ukraine’s commercial banks, and how much IMF money will be requested to bail them out. Last week Gueorguiev confirmed by telephone from his IMF office in Washington that Kubiv (right) is in charge of the investigations the IMF has ordered of Ukraine’s banks. Gueorguiev also said that Kubiv is currently discussing with the IMF mission the criteria to be adopted in order for IMF funds to be used to recapitalize the Ukrainian banks, when its shareholders either refuse to pay, or lack the funds themselves. That story can be read here. Kubiv, 51, was born in eastern Ukraine, but he has spent most of his life in the western provincial capital of Lviv. A Reuters publication at the time of his appointment to the NBU in February noted that he “headed several commercial banks before he was elected to the parliament”, but omitted his removal from Kredobank. 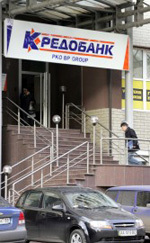 “I promise … the transparency of the National Bank”, Reuters claimed Kubiv said. After he had been dismissed from Kredobank, Kubiv says he was appointed “professor of marketing and logistics” at a local university, and took a seat on the board of Bank Lviv. In 2013 Bank Lviv’s retail banking business was lossmaking, and its offsetting corporate business resulted in a bottom-line income that was close to zero. Its loan book at the end of 2013 was UAH 686 million ($83 million). An auditor’s note discloses that 12% of its loans were to related parties. 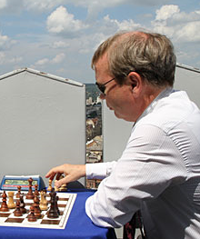 In 2012 Kubiv was elected to the Verkhovna Rada as a member of the Batkivshchyna party headed by Yulia Tymoshenko.” In January he was active in the protests against President Victor Yanukovich in Lviv. Ukrainian media reports claim Kubiv was “a compromise candidate” who would keep his NBU post until after the election of the new president. Polish reporting of Kubiv’s role in the Kredobank losses were summed up by Jacek Łęski, a leading Polish journalist, in a Twitter posting on February 24. According to Łęski, Kubiv’s NBU appointment was “bad news. PKO BP [Bank Polski] issued 1 billion zł to repair what he did in Kredobank.” Speaking from Kiev this week, Leski confirms calling Kubiv “aferzysta”, the translation of which he said should wait until he has returned to Warsaw. 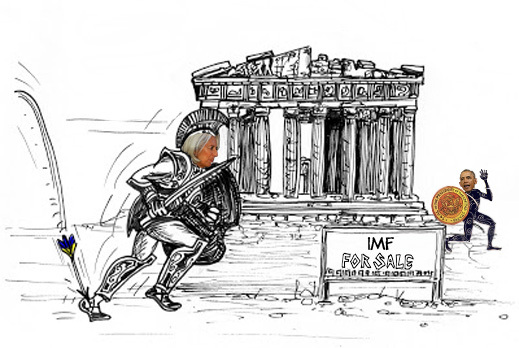 Lagarde has claimed publicly that “on the implementation front, we are taking all the precautions we can in order to mitigate those risks”. Lagarde was asked what she knows of the extent of the loan loss audit by Bank Polski of Kredobank, Kubiv’s removal, and his responsibility for a half-billion dollars in financial damage? According to the IMF staff report issued when Lagarde secured IMF board approval of the $17.1 billion Stand-By Arrangement on April 30: “banks should be required to conduct enhanced due diligence on business relationships with domestic politically exposed persons, and NBU is going to properly assess the fit and proper requirement, including requirements to check the source of wealth/funds of owners of qualifying holdings of banks.” On Monday Lagarde ordered a blackout on the due diligence the IMF has done on Kubiv. Christoph Rosenberg, a German national, was the IMF resident representative in Warsaw when Bank Polski and Pruski intervened at Kredobank, uncovered the loan losses, and fired Kubiv. Rosenberg, still at the IMF, was asked what he knew then, and what he reported to Washington. He responds that he is forbidden to say. On retirement from the presidency Kwasniewski (right) became a booster for Ukrainian membership of the European Union. 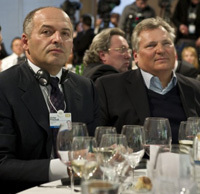 He was employed to do that by Victor Pinchuk (left), who put at least a million dollars into Kwasniewski’s Amicus Europae foundation. Polish sources report that between 2010 and this year, Pruski’s role at the Polish presidency was more honorary than real. But on March 10, 2014, that appointment was cancelled, and he was engaged as a paid advisor in the chancellery of President Bronisław Komarowski. Contacted in Warsaw at his office, following a meeting Monday of the management board of the Bank Guarantee Fund, Pruski was asked whether as chief executive of Bank Polski at the time of the Kredobank investigation, he knew whether the evidence on Kubiv’s conduct had been referred to the Ukraine prosecutor and police authorities. Pruski was also asked what information on the case had been passed to the IMF at the time, or since Kubiv’s NBU appointment in Kiev. Pruski asked for more time before answering; he then refused to reply. James Roaf, a British national (below left), is Rosenberg’s successor in Warsaw, and the current IMF representative for Poland. He also supervises Ukraine, where a Frenchman, Jerome Vacher (right), is the IMF resident. 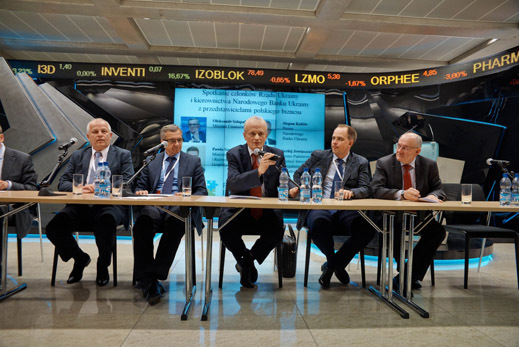 Kubiv is at far left; next to him is Ukrainian Finance Minister, Oleksandr Shlapak. They were participating in a meeting of the Polish-Ukrainian Chamber of Commerce (PUIG). — How does Mr Kubiv describe and explain his dismissal from Kredobank by Bank Polski in 2008? — What responsibility does Mr Kubiv believe he has for the loan losses which occurred during his leadership of Kredobank? 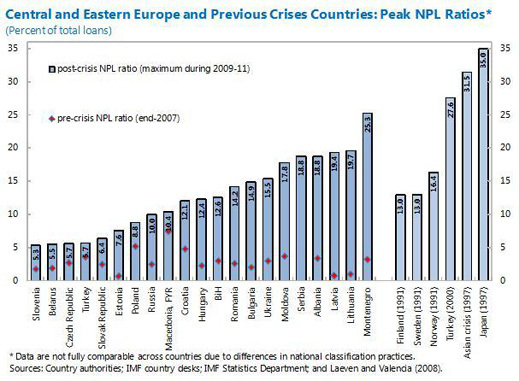 — did Mr Kubiv benefit personally from the unusually high NPL/loan loss rate? — does Mr Kubiv believe that his experience of bank fraud, insolvency, and supervision failure at Kredobank make him eligible to run the NBU now? At publication time, Kubiv and NBU have not responded. Kredobank is also not replying to questions about Kubiv’s performance at the bank.